The air pulses with each beat of the drums, the guitars and horns rising in a crescendo as they follow the two lead singers as they braid their voices together, sounding as much a call from an ancient time, as they also sing a modern folk rock ballad. Of Monsters and Men played at the Greek Theater Thursday night near the start of their 2015 international tour promoting their new album Under the Skin to an electrified crowd that packed the stadium as they delivered an elegant and pulse pounding show. The band from Iceland came to international acclaim off their first album My Head is An Animal in 2011, when the album reached No. 1 in Australia, Iceland and Ireland and No. 1 on the U.S. Rock and Alternative charts, and the band was tapped to write a song for the Hunger Games 'Catching Fire' and then Dirty Paws, a single, broke out again when used almost in its entirety for the trailer for Walter Mitty 18 months after its release. The mood at the Greek was oddly eerie before the show, as moody music played and fog issued forth on the stark set, of large chrome bars which stood behind the band's set up in a series of large "M" shapes. The five member indie folk pop band, playing on this tour with four accompanists on brass, drums and keyboards, kept the mood electric and plibal. The band opened their set with new songs Thousand Eyes, Crystals and then King and Lionheart from their debut album. Their songs have an unusual quality, as if an ancient power is built within, but also feel comfortably spun in the present. They sing about what so many bands do, stories filled with tears, fears, confusion and hope, but they pull pull us in with a promise of intimacy and then lift us with pounding percussives and soaring tones that become epic anthems. The two co-lead singers, singer/guitarist Nanna Bryndís Hilmarsdóttir, and co-singer-guitarist Ragnar Þórhallsson, have uniquely different sounds. His voice edgy and razor sharp, and hers angelic and ethereal. Guitarist Brynjar Leifsson, drummer Arnar Rósenkranz Hilmarsson and bassist Kristján Páll Kristjánsson completes the group. Ragnar busts a string on his guitar early in the set, but without missing a beat changes instruments as they roll into Dirty Paws, a hit off their first album, which starts with his melodic acoustic finger work, and slowly builds into a rousing soundscape, half thunderstorm, half meditation. Nanna thanks the crowd and tells us about Winter Sound, a song from their debut, "could be a tribute to Iceland and the very bad winters we have there. We wrote this one on a winter night." And the song thrums a pounding martial beat, as if the storm approaching is coming to wage war and you'd better appreciate the power of nature and have a good attitude. The many chrome bars behind the band had beams of light gliding along them, as well as aiming spot lights which splashed across the audience as the music filled the stadium through the evening. Nanna loses herself in each song, almost like a child, as she gestures with her hands as if they are part of her voice. Human, I Of The Storm and Mountain Sound came next, one of their biggest hits off the first album, which was upbeat and brought people into the aisles to dance. "We love LA!" says Ragnar. "It's great to be back. We'd love to have a house here, but we can't afford it!" He says to the laughter of the crowd. Wolves Without Teeth, from the new album, sends the stage into a red wash and feels like a Celtic song, a powerful declaration of love, passion and poetry. Lake house, followed, an older song, starting softly, as the band so often uses this technique, then pulls us into a collective rhythm as they crush us under the soundscape of their drums, guitar and synthesizer. This song turns into one of the happiest jams of the night until ending in the same unique pause which ends so many of their songs, as if the final statement is never made, but implies the song is more of a question, held open at the end, waiting for more. Little Talks, their number 1 hit from their debut album and Six Weeks came next, and by the end of that jam four of the band members were pounding four different drums, a finale that was a screaming chant, as the singers glided over the percussion at the end as the instruments had gone quiet and the stage had gone dark except for strobes behind the band as they finish. The crowd roared for more as the band cleared the stage and they returned for an encore of three songs, Nanna sharing that the first encore song "we've never played at a concert before, it's important, so would you like to hear it? We beefed it up a bit!" She promises, and the cheers are her answer as they play Organs from their new album, sung only by her on guitar, a quiet ballad. They follow with Silhouettes, which they wrote for the Hunger Games. It starts slow and sad, but by the end has three drummers pounding out pure defiance. The band ends the evening with We Sink, another new song, a great finale as Nanna's voice of liquid angelic light joins the raspy and mortal voice of Ragnar and together they weave a thread between the two realms and take us with them. 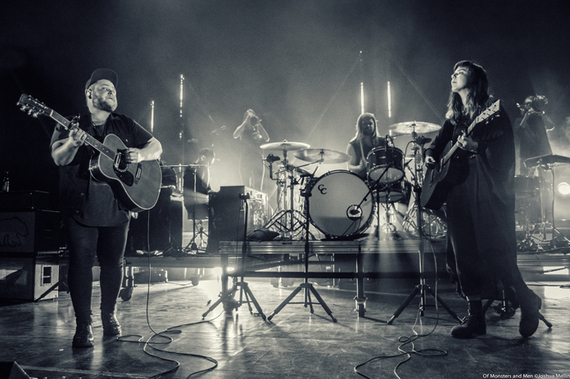 Of Monsters And Men are currently on tour, for more information: Of Monsters and Men.